This Saturday’s homecoming festivities will be a little extra special for Homecoming Queen Leslie Saloom. Fifty years ago, her grandfather retired Judge Kaliste Saloom Jr. escorted the homecoming queen while serving as president of the Alumni Association at the time. This year, her grandfather will watch as Saloom is crowned during the Ragin’ Cajuns’ 1000th football game on Nov. 1. Kickoff between the Ragin’ Cajuns and Florida International is set for 4 p.m at Cajun Field. The retired judge can remember when football games were played behind the old Martin Hall. 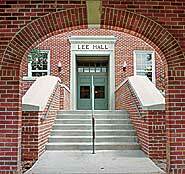 “We would walk behind the old Martin Hall and see players like Chris Cagle,” he said. He also has memories of each of UL Lafayette’s former presidents. “ I can remember Dr. Stephens sitting on the steps in front of my parents’ store while his wife and daughters shopped inside,” said Saloom. Leslie Saloom is a senior studying public relations with a minor in business at UL Lafayette. She interns in the Athletic Department’s Compliance Office. She hopes to continue working in the athletic arena post graduation. Saloom is the daughter of Judge and Mrs. Douglas J. Saloom. Sigma Gamma Mu, the Communication Honor Society, nominated her to the Homecoming Court. She is a member of the Public Relations Student Society of America, the Association of Future Alumni, the Honors Program, Rho Lambda (Greek Honor Society) and Phi Kappa Phi (Business Honor Society), as well as being Vice President of Public Relations of Kappa Delta, Staff Liaison for the Ragin' Peppers, President of the Order of Omega (Greek Honor Society), and an intern in the Office of Compliance in the UL Athletic Department. She has received the Margaret Budd Haemer and Founders Scholarship from Kappa Delta Sorority and has made the Dean's list every semester since 2005. She is the Shamrock chairperson helping to raise money and promote awareness for Prevent Child Abuse America and Prevent Child Abuse Acadiana. Maids of the court are Megan Broussard, Britany Cormier, Sarah Delahoussaye, and Margo Huval, all of Lafayette.